Ladies, we’ve all heard the ever-repeated beauty advice to exfoliate skin at home for healthy, clear, glowing skin. But really, how much is said about the how, when and why about it? Well, it definitely is an essential step to help get the skin you always wanted, so we decided to clear all your doubts about it. We explain all there is to know about how to exfoliate skin at home to help you master it for an envy-inducing complexion. Exfoliation is a process where you use a mild abrasive to scrub/wash away the dead skin cells that clog up pores and cause flaky dull skin. As you age, dead skin cell build up can tend to make you look old, dull and washed out. Dead skin cells build up all over your body therefore it is recommended to exfoliate all over. When you regularly exfoliate skin at home, it helps your skin better absorb serums, moisturisers and make-up, which is why It is the key to a healthy glowy complexion. Five reasons you need to start exfoliating your entire body right away! 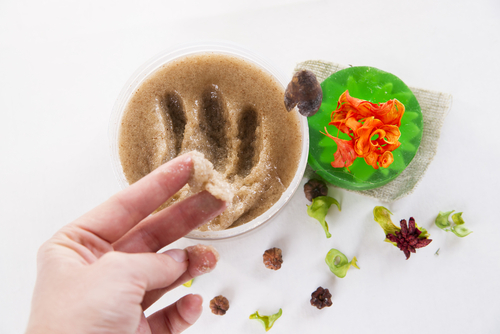 Exfoliation scrubs off the top layer of dead skin cells, thus removing buildup from your pores. Bye-bye blackheads, whiteheads and dry patches! It is the key to improving your skin texture. Post exfoliation your skin feels squeaky clean. Clean skin is the recipe for a healthy glow! Exfoliation stimulates blood flow to the area, which helps your skin look radiant. It sloughs away roughness, giving you softer skin. It helps all the stuff that you slather over your face and body be better absorbed into your skin. Ladies, trust us: that foundation will glide onto your face like a dream and your moisturizer will penetrate better. Exfoliation may be your secret to getting that healthy glow back, but how much is too much? Too much exfoliation can strip your skin of its natural moisture and give you dull and dry skin. Depending on your skin type and sensitivity level, choose a scrub and your frequency. Weekly exfoliate skin at home to maintain healthy skin balance. However, if you suffer from extremely sensitive skin begin once in 10 days and slowly bring it up to once a week. If you have oily skin or live in hot humid conditions, you may want to use a gentle exfoliant two to three times a week to exfoliate skin at home, depending on your skin. 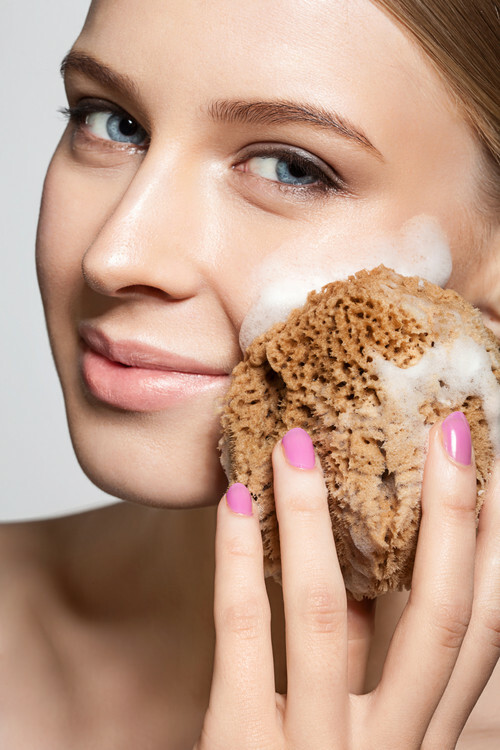 What Should You Use To Exfoliate skin at home? There are a lot of exfoliating products available in the market. Choose one that is best for your skin. An exfoliator, if in the form of cream or gel, should have a sand-like consistency. It shouldn’t be too harsh, while it shouldn’t be too gentle either. If you prefer not using store-bought products, you can choose between all natural ingredients available in your kitchen. Brown sugar, baking soda, sea salt, along with any oil of your choice, are cheap and easy DIY alternatives to exfoliate skin at home. Throw in some raw ground up oats into your DIY scrub if you have extremely dry skin. A drugstore exfoliant that won’t fail you is the St. Ives Fresh Skin Apricot Scrub (Rs. 531). This has been around for years, and rightly so. If you feel like pampering yourself, look out for The Body Shop Olive Body Scrub (Rs. 1,095). And, of course, please moisturize immediately after. It is the most important part of your exfoliation routine. If you don’t feel like slathering on a rich moisturizer, aloe vera gel works just as well. Images: Shuttertstock HAVE A STORY IDEA FOR POPxo? If you want to hear about it, we can write about it! Just tell us your idea here! MUST-READ: Glow No More! 8 Things That’ll Happen If You DON’T Exfoliate MUST-READ: 10 BEST Face Masks In The Market For Beautiful, Glowing Skin!